With so many enticing destinations on offer, travellers have a difficult time deciding where to spend their precious vacation time. A tropical island? A vibrant city? A wildlife safari? 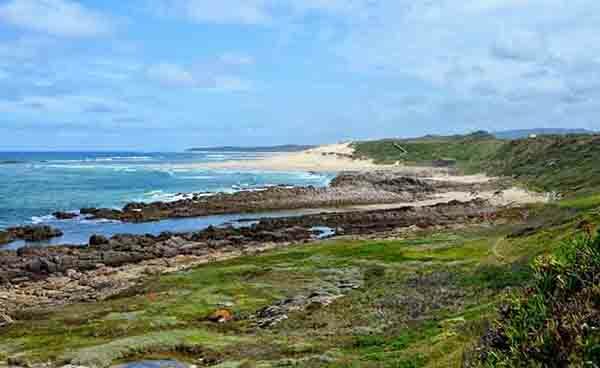 The choices and combinations are endless, so we’ll skip the part where I tell you about the Eastern Cape’s many attractions: wildlife, city, cultural and coastal, and say straight out that this article is for those who can’t imagine planning their holiday without packing at least one piece of swimwear. It is an Eastern Cape guide for those who like to float in a rockpool, feel the cool breeze over water and thunder through the waves – this is a water-lover’s guide to the Eastern Cape…Just fly in to Port Elizabeth or East London and take off…into the blue. 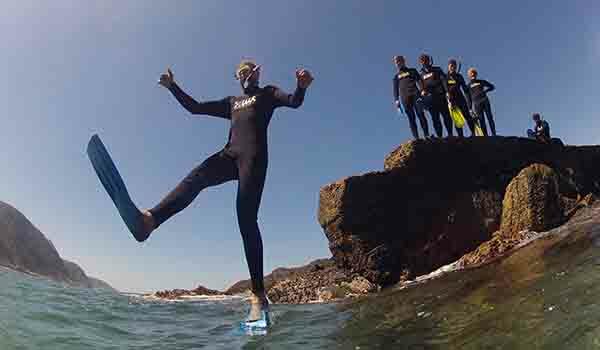 INSIDER TIP: If you’re visiting Coffee Bay on the Wild Coast, book a walk to the Mpuzi cliff and caves for secret pools, caverns and an adrenaline-inducing cliff jump into the Mpuzi River. INSIDER TIP: Make your way to Middle Beach, and Blue Pool, in Kenton for a special snorkel or swim in this famous rock pool. Best enjoyed at mid to low tide. INSIDER TIP: Sardinia Bay is one of Nelson Mandela Bay’s best-kept secrets – a sweeping stretch of coastline with a sheltering rock ledge which creates beautiful blue lagoons that are perfect for swimming and snorkelling. INSIDER TIP: If your heart is set on a visit from our local dolphins, head to Dolphin Beach in Jeffrey’s Bay, Kouga, for a good chance of encountering our marine friends. INSIDER TIP: The bay at Storms River Mouth is home to a vast array of marine life and, when the water is clear and conditions right, visitors will often spot many smooth-hound sharks in the waters beneath the suspension bridge. 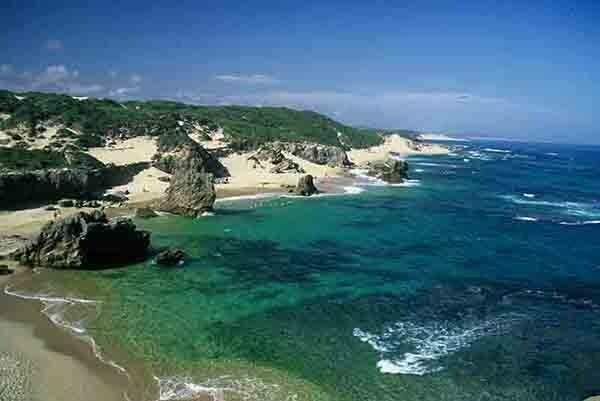 Catch a tan, catch a wave, swim, paddle, surf, snorkel, dive, float your way around the Eastern Cape. If your travel plans are taking you away from the coast, don’t worry about a thing. The Fish River transects the arid Karoo Heartland and is excellent for paddling, white-water rafting and tubing. In the highlands of the Amathole Mountain Range, you’ll find mountain streams, waterfalls and rock pools cool and clear amongst the forest ferns. INSIDER TIP: Wherever you are headed in the Eastern Cape, especially in our warmer months, pack a swimsuit as many of our accommodation establishments have swimming pools or farm dams to revive you after a day of exploring under the South African sun! Awesome beaches, wonderful lagoons, magical rockpools and most excellent extreme adventures, cultural wonders and wonderful South African wildlife … where else would you rather be?